[pullquote style=”left” quote=”dark”]Santur is a Persian Hammered Dulcimer. It is a trapezoid-shaped box often made of walnut wood. [/pullquote]The mallets (Mezrabs) are feather-weight and are held by the thumb, index and middle fingers. 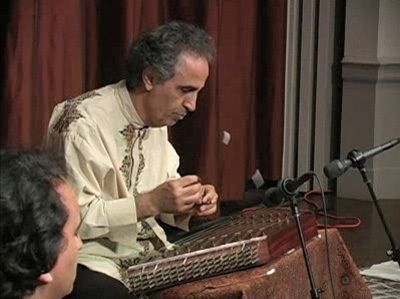 The 72 string Persian santur has two sets of bridges, providing a range of approximately three octaves. Santur can be traced back to pre-Islamic Persia (Approx 1500-1800 years ago) and its name has been mentioned in early Persian classical poetries. Similar forms of the santur have been present in neighboring cultures like China, India, Afghanistan, Armenia, Turkey, Iraq and Greece. Main santur players responsible for passing the traditional classical santur playing to the following generations with their performance and teaching and Ostad Aol Hassan Saba was the most important figure for passing this valuable art form to the future generations of santur Masters.